These past two years have been such a whirlwind, and I’ve had so many highlights that I know I’ll remember for a long time. I’ve stood in front of and presented to the largest crowds I’ve ever spoken to (upwards of 200+ individuals at a time), attended 5 conferences under scholarship across numerous cities and states, went on a Eurotrip with some of my best friends in the program, lived across the Pacific Ocean for three months (the longest I’ve ever been away from home, my friends, and my family), and learned about what it means to be the best occupational therapist I can be. Interspersed in these bigger events, life bestowed upon me lessons about myself, people, and life in general. I’ve learned and grown so much not only as an aspiring OT, but also as a person. - Relax and do your best. You will be fine. | Work hard and do your best obviously, but don’t stress out too much about it. That 1 point you got off a test or assignment will not matter 20 years from now. - The power of influence (both good and bad) | You will meet so many people who you both will inspire and be inspired by. For the people you are inspired by, choose wisely. For the people you inspire, make sure you not only say what you mean, but live it out too. People are always watching, and what you do trumps what you say every time. - Remember your core values and live accordingly. | You will make a core values checklist during your first semester in the program. Look at it often. Are you living in a fashion that is congruent with what you believe? - Get to know the people around you and create meaningful relationships with them. | Again, you will meet so many different people. Get to know your peers, colleagues, friends, mentors, clinical instructors, and so on, on a deeper and more meaningful level. This life is about creating meaningful relationships. - Walk through doors that open up for you and take opportunities that fall into your lap. | Trust me, it will happen and it might even be a little scary. Everything happens for a reason! - Always remember the big picture. | You are in school because you want to positively change people’s lives and help them live life to its fullest. This is always the goal. - Remember to take care of yourself, have fun, and live your best life! | True: school is going to take up a huge chunk of your life. Also true: remember to live YOUR life too. My amazing and incredibly supportive family! I recognize there is absolutely no way I could have gone through graduate school alone. I am so thankful for Kimberly Kho and the Admissions team for providing guidance and support professionally and personally, my amazing Student Ambassador team (Ali, Erika, Caroline, Linah, and Bryan) for being the best group of people I could’ve ever asked to work with and for making what we do that much more fun and rewarding, the OTAC Student Delegate council for connecting me with OT throughout the entire state of California, OTSC Executive Board for being such an inspiring group of leaders, crazy Cohort C for being the most fun classmates to go through the program with, the Division’s faculty for always going above and beyond what is expected inside and outside of the classroom, and of course, my incredible and loving family and friends for helping me up through the lowest days and for walking alongside me during the happiest ones. Thank you again USC Chan Division of Occupational Science and Occupational Therapy. What a journey it’s been, and I can’t wait to see where life takes me next. 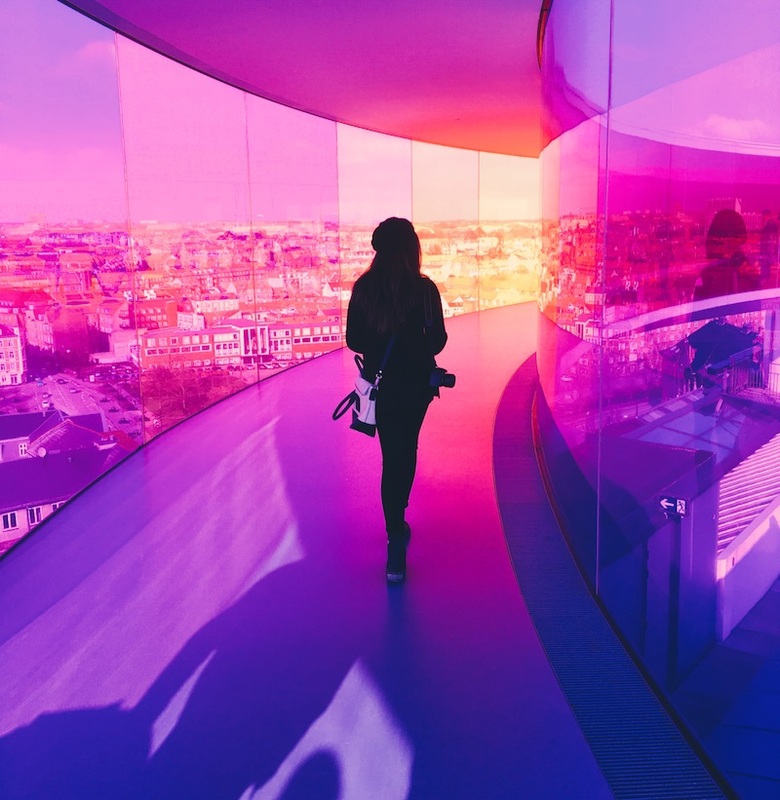 Denmark has been one of my top places to visit for the past few years now, as I knew that they were consistently ranked one of the happiest countries (if not the happiest) in the world. I was particularly interested in their efforts in eco sustainability, health care system, biking culture, and “hygge”. Thus, when I was offered to go to Denmark for my leadership externship for two weeks in collaboration with USC Global Initiatives and Southern Denmark University, I knew that 1) I had to go and 2) it was meant to be (duh!). During the two weeks, our schedule was jam-packed with presentations, activities, and cultural exchanges! In the first week, my team and I presented to Metropolitan University College, Southern Denmark University, and University College Lillebaelt on how education and healthcare systems function in America, what USC’s OT program looks like specifically, and some of the research being conducted at USC. As much as we were the ones providing information to Denmark’s school departments, students, and faculty, they also provided an abundant amount of information about themselves, their research, and their culture in return. During the second week, we visited Hammel Neurorehabilitation and attended an Ergo Symposium hosted at Southern Denmark University, where Dr. Renee Taylor, one of the authors of a textbook we use in the program, was a speaker! In that same week, we had the amazing opportunity to shadow occupational therapists at Odense University Hospital in various departments (i.e. hand therapy, pediatrics, TBI, trauma, oncology, etc.). While shadowing at Odense University Hospital, it was evident to me that the free healthcare system adopted by Denmark affects the way OTs practice there. - The importance of work-life balance | In Denmark, employees receive 6 week paid vacations (which does not include sick days) and 1 year paid maternity leave. Speaking of sick days, it is actually looked down upon if you go into work sick (if you’re sick, you’re sick… Don’t be selfish and contaminate the work environment, they say!). Overall, the Danish really embody the idea that when you leave work, you actually leave work and live your life. - The importance of saying what you mean and meaning what you say | Here in America, it is so common for me to say to almost everyone, “Hi! How are you?” In Denmark, however, this customary greeting does not equivalently translate. We were told that you do not ask someone, “How are you?,” unless you are prepared to get an actual answer about how they are doing. In short, people in Denmark do not say things unless they mean it. For example, they will not offer to do something they do not want to do, and will not sugarcoat things or beat around the bush. - The importance of humility | In the working world of America, we like to rack up all of the accomplishments we can so that we can put them on our resume. This is something we have to do in order to be a competitive applicant. Interestingly enough, they do not do that in Denmark. For the Danish, it is actually looked down upon if you try to upstage the people around you and/or try to make yourself stand out and look better. Showing off how much money you have, how great your career is, etc. are big no-no’s in Denmark! This idea relates to Denmark’s emphasis on equality (see: below bullet point). - The importance of equality | The emphasis on equality is reflected in so many ways in Denmark. For example, education is completely free (as a university student you also get a monthly stipend), and so is healthcare (it doesn’t matter if you’re homeless or if you’re the richest person in Denmark, as both will get the same level of care). - The importance of trust | They trust everyone in Denmark. On one particular day, we walked by a restaurant and there was a peaceful child sleeping in a stroller outside without the parents! It is probably safe to say that would not happen here in America, but it’s refreshing to know that there is so much inherent trust within the people in Denmark. Taken altogether, this experience has been a highlight in my time here as a USC OT student. I’ve always loved traveling, and this trip was confirmation why. The world is so big, and there is always more to explore. It is so incredibly easy to simply go through the day-to-day motions and be stuck in the bubble of Los Angeles, but traveling always grounds me and forces me to expand my ways of thinking. There is more to life than the life lived here in LA. Mange tak (many thanks) to Dr. Danny Park, Benedict of the Global Initiatives Team, the kindhearted students and Dr. Jeanette Christensen of Southern Denmark University, and my wonderful team of 7 for a life-changing international experience. I have met a lot of amazing and inspiring people during my journey to becoming an occupational therapist. While I try to preach equality as much as I can, there is still one patient that remains one of my favorites to this day. In my freshman year of college, I volunteered at USC Norris Comprehensive Cancer Center, where I met the woman who would spark my road to health care. Without going into too much detail, she was the kind of woman who wore lipstick everyday even though symptoms and side effects of her diagnosis and treatment yielded a thinning (and nearly disappearance) of her lips. She told me countless stories about her life in her twenties and early thirties—all of places she had lived, all of the countries she had traveled to, and all of the men she had to date before she found her husband (this is my mini plug to say happy belated Valentine’s day!). She was such a light in my life at the time (and still is, to be quite honest) and my interactions with her and all of the other patients in that hospital are what solidified that working with patients in healthcare is what I wanted to do for the rest of my life. Golden hour outside City of Hope. That was nearly 7 years ago (wow, how time seriously and flies! ), and since then, oncology has always held a special place in my heart. As I continued OT school, I was so happy to discover that OT does play a role in cancer care as well. With that being said, a few weekends ago I attended the ‘OT in Oncology Symposium’ hosted by OTACand City of Hope. This is the first time they’ve held an event like this on this topic, so I knew that I could not pass up the opportunity. At this event I learned about a multi-pronged approach to cancer-related fatigue, pediatric oncologic OT in acute care, a comprehensive approach to address cancer-related cognitive impairments, evaluation and treatment of of chemotherapy-induced peripheral neuropathy, psychosocial interventions across the continuum of cancer care, and even how to manage cancer as a chronic condition using a Lifestyle Redesign® approach (lectured by our very own, Dr. Camille Dieterle). Symposiums are always fun with a friend! I went with Jen, a friend of mine who is also in the program. Within these topics, I learned about how fatigue, as a result from cancer, can negatively affect cognition in patients’ everyday lives and how we, for example, can educate the client on how to take proper rest breaks throughout the day. I also learned about the importance of facilitating normalcy and encouraging toddlers with cancer to participate in play in order to yield a sense of autonomy and self, even in a setting like a children’s hospital. In addition, I learned different exercises (i.e. median nerve glides, overhead elbow active range of motion stretches, etc.) to incorporate into treatment sessions with patients to help reduce edema (swelling) and increase tissue circulation in the body. I learned a lot more but if I kept on going this blog post would be way too long! Outside City of Hope, there are trees you can attach written notes on. A lot of the notes had messages of hopes, wishes, and desires for loved ones. One of the biggest takeaways I learned from this symposium is that in oncology care (and in any area, really), an extremely essential role for OTs is to present and instill hope in our patients. Yes, as OTs we assess and work on patients’ instrumental activities of daily living (IADLs), activities of daily living (ADLs), and range of motion (ROM), but an even more important role is that we aim to make our patients feel understood and really look at what roles are most impacted during this time in their lives. A role can be that of a mother who wants to be able to pick up her child, or it can even just be that of a woman who wants to be able to put lipstick on every day. The “occupation” part of “occupational therapy,” is defined as any meaningful activity that comprises a person’s everyday life. For some people, their meaningful activity in life can mean their career, but for others, it can be socializing with their friends, brushing their teeth, brushing their hair, cooking, engaging in arts and crafts at school, and so on. Here, I define ‘occupation’ first. I feel like once people understand our meaning of ‘occupation,’ it is a much easier concept to grasp. Therefore, OT is a health profession that empowers and enables individuals of all ages to engage in these occupations to the best of their abilities despite any injury, disease, or disability. Here, I define occupational therapy. At this point, I’ll list examples of different places OT can work and what they do in those settings. Part of the reason why OT is so hard to grasp is because we can be found anywhere and everywhere! To try and solidify everything I’ve said, I’ll either talk about my personal experiences or somehow make the connection to something that will make sense to the person or people I am talking to. If I’m talking about a personal experience, I’ll tend to talk about OT’s role in animal-assisted therapy and my involvement with Assistance Dogs of Hawaii as a clinical rotation. Another connection I frequently make is related to the Marvel movie, “Doctor Strange,” which works well with the kids/male population/anyone who likes Marvel movies but knows nothing about health care. In summary, Dr. Strange, a neurosurgeon, gets into a car accident in which he injures both of his hands. In the movie, he sees a hand therapist (most likely an OT), who helps rehabilitate his hand so that he can get back to his meaningful occupation of performing surgery (and being a superhero later on, obviously). Defining OT is all about practice, catering to your audience, and having a positive attitude about it! There is no right or wrong way to talk about a career you love.